Schwerin is the capital of the state Mecklenburg-Vorpommern. The population, as of end of 2007, was 95,855. 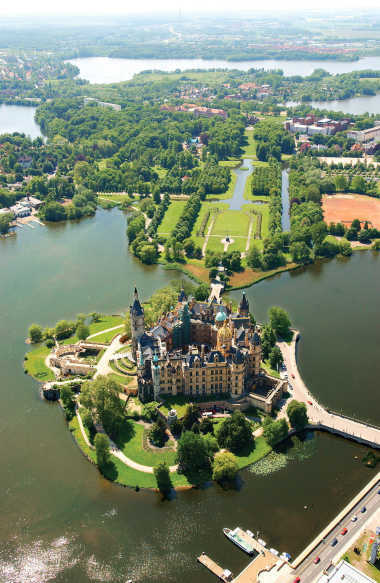 Schwerin is surrounded by many picturesque lakes. The largest of these lakes is the Schweriner See. In the midst of these lakes there was once an Obotrite settlement (dated back to the 11th century). The area was called Zuarin, and the name Schwerin is derived from that designation. In 1160, Henry the Lion defeated the Obotrites and captured Schwerin. The town was subsequently expanded into a powerful regional centre. A castle was built, and expanded upon over the centuries, on this site. In 1358, Schwerin became a part of the Duchy of Mecklenburg, making it the seat of the dukedom from then on. About 1500, the construction of the Schwerin castle began; it was here that the dukes resided. After the division of Mecklenburg (1621), Schwerin became the capital of the Duchy of Mecklenburg-Schwerin. Between 1765 and 1837, the town of Ludwigslust served as the capital, until Schwerin was reinstated. After 1918, and during the German Revolution, resulting in the fall of all the German monarchies, the Grand Duke abdicated. Schwerin became capital of the Free State of Mecklenburg-Vorpommern thereafter. At the end of World War II, on 2 May 1945, Schwerin was taken by U.S. troops. It was turned over to the British on 1 June 1945, and one month later, on 1 July 1945, it was handed over to the Soviet forces, as the British and American forces pulled back from the line of contact to the predesignated occupation zones. Schwerin was then in the Russian Occupation Zone which was to become the German Democratic Republic (GDR). Initially, it was the capital of the State of Mecklenburg which at that time included the western part of Pomerania (Vorpommern). After the states were dissolved in the GDR, in 1952, Schwerin served as the capital of the Schwerin district (Bezirk Schwerin). After reunification in 1990, the former state of Mecklenburg-Vorpommern was recreated as one of the Bundesländer. Rostock was a serious contender as state capital but the decision favored Schwerin. Schwerin’s unique landmark, the Palace, seems like out of a fairytale. It is situated on an island in the lake Schweriner See and used to be the seat of Mecklenburgian dukes. Today it houses the Parliament of the federal state of Mecklenburg-Vorpommern plus the impressive Palace Museum. In the museum you have the opportunity to view the chambers and representational rooms of the grand dukes, the magnificent throne hall and much more. A skillfully designed park and beautiful paths invite you to wander through the Palace Gardens. And if after all that walking you need to sit down and take in what you’ve just seen, the Schlosscafé and the Orangerie Café are the perfect places to do so.